Tópico em 'África, Ásia e Oceânia' iniciado por Luis França 3 Jan 2008 às 20:09. PEOPLE watching the treacherous surf from the beach were knocked off their feet by freak waves, a boat full of lifesavers was flipped over, and surfers were swept out to sea as the Coast was hammered by huge surf yesterday. All beaches on the Gold Coast were closed as winds of up to 90km/h whipped up dangerous waves that caught plenty off guard. Two people were stranded in waist-deep water after a freak wave pounded them against eroded dunes at The Spit about 2pm yesterday. They were forced to cling to poles under the sand-pumping jetty to avoid being swept out to sea. A huge crowd of people, including small children, also risked their lives trying to get a closer look at Mother Nature's fury by venturing to the end of rock wall at The Spit. E nós a ve-las passar aqui davam jeito para fazer uma limpeza ás praias, tão cheias de todo o tipo de artilharia de guerra. Inundações estão causando prejuízos nas plantações da Austrália, que recentemente haviam sido arrasadas por um longo período de seca. O país enfrenta uma série de fortes e esporádicas tempestades que atingiram dois dos maiores Estados agrícolas do país, Queensland e Nova Gales do Sul. Neste último, centenas de fazendeiros foram afetados. O governo estatal declarou a região costeira área de desastre natural, com uma estimativa de US$ 18 milhões em danos a plantações, animais e infra-estrutura. Já no sudeste de Queensland, as inundações foram descritas como as piores dos últimos 20 anos. Fazendeiros que já dependiam da assistência do governo por conta da seca que se estendeu por quase uma década agora precisam da ajuda oferecida a vítimas das enchentes também. O governo federal disse que está providenciando assistência a comunidades afetadas em Nova Gales do Sul, Queensland e Território do Norte, se necessário. "Para famílias atingidas pelas enchentes, será dado US$ 140 por pessoa e cerca de US$ 646 por família para suprir necessidades básicas como comida, roupas e acomodação", declarou o primeiro-ministro de Queensland, Paul Lucas. O governo federal providenciará ainda um fundo para ajudar a reparar os estragos em rodovias e demais infra-estruturas. Cerca de 300 pessoas, incluindo voluntários, ajudam as vítimas das enchentes. Metereologistas avaliam que o pior da tempestade já passou, uma vez que o ciclone Helen não se intensificou no norte de Queensland. No entanto, a previsão é de mais chuva e inundações. A passagem do ciclone e o mau tempo também interditaram as principais praias do Estado. Os turistas tiveram que se contentar em observar os surfistas arriscarem manobras em ondas de até três metros. Nova Gales do Sul é considerado o Estado mais atingido pela seca. Normalmente, produz cerca de 8 milhões de toneladas de trigo no inverno, número que diminuiu em 40% nos últimos anos, segundo dados do governo. No ano passado, a Austrália passou pela pior seca que tem registro em sua história. Em outubro, o Departamento Australiano de Agricultura e Fontes Econômicas previu uma colheita de trigo 22% menor do que a normal em todo país, contabilizando 12,1 milhões de toneladas do produto, o que corresponde a menos da metade produzida no ano de 2005 e 2006. Surfers catch SOME OF THE BIGGEST WAVES EVER SEEN - In the middle of the weekend storm, surfers were bravely making history at a break off the California coast. The waves were breaking about a hundred miles off the California coast Saturday, at a spot called the Cortes Bank. It's an underwater seamount that created waves, the surfers say, that were larger than 80 feet on the face and THE BIGGEST SEEN OR SURFED ANYWHERE IN THE WORLD. A crew of elite "tow-surfers" used jet skis maxing out over 40 miles per hour to catch the beasts. The massive swell that hit the New South Wales South Coast over the weekend provided ideal conditions for experienced surfers. "Everyone's calling it 'Super Saturday'." Some of the surfers said they were the best waves they've ever seen in the country. "A couple of the waves were up there with the best waves I've ever surfed." Image: HOME TURF: Pro surfer Paul Morgan flew home from Hawaii to catch the ultimate wave at Bawley Point on Saturday. "All the elements lined up to provide VERY RARE surfing conditions" at Bawley Point. "It was a REALLY UNUSUAL event for this area." Image Left: Conditions were perfect for surfers at Bawley Point on Saturday - although many were content to watch the action from the safety of shore. They’ll talk about Super Saturday for years - The tropical low off the Queensland coast saw an UNUSUALLY consistent big swell pelt the coast for days. It was not unusual for the region to see such big swell, but it was UNUSUAL that it lasted for so long and remained so consistent. "It was epic." The photos you see here are of waves breaking about a hundred miles off the California coast Saturday, at a spot called the Cortes Bank. It's an underwater seamount that created waves, the surfers say, were larger than 80 feet on the face and the biggest seen, or surfed, anywhere in the world. Safa ... a mim é que não me apanhavam ali .... aquilo deve pra i uns 15 metros de altura ... o surfista parece uma formiga!!! 80 feet, quantos metros dá isso ??? Alguém me pode dizer, please !!! São ondas de 24/25 metros...nada de especial a culpa é das alterações planetárias...tambem as havemos de ter se o Altântico quiser. 625mm em 3 horas, em Mackay/Queensland Austrália. HUNDREDS of Mackay residents have spent the night in emergency accommodation after their homes were swamped by floodwaters from the biggest downpour to hit the city in 90 years. Residents of Mackay begin a massive clean up today with more than 2000 homes damaged in flooding sparked by an incredible one-day rainfall of 625mm yesterday. Hehe alguém deve ter estoirado um cano lá em cima isso é memso muita fruta. A Austrália é um país esquesito meteorologicamente falando. Um dilúvio É 4 ou 5 vezes aquilo que caiu em 25 de Novembro de 1967 na região de Lisboa. 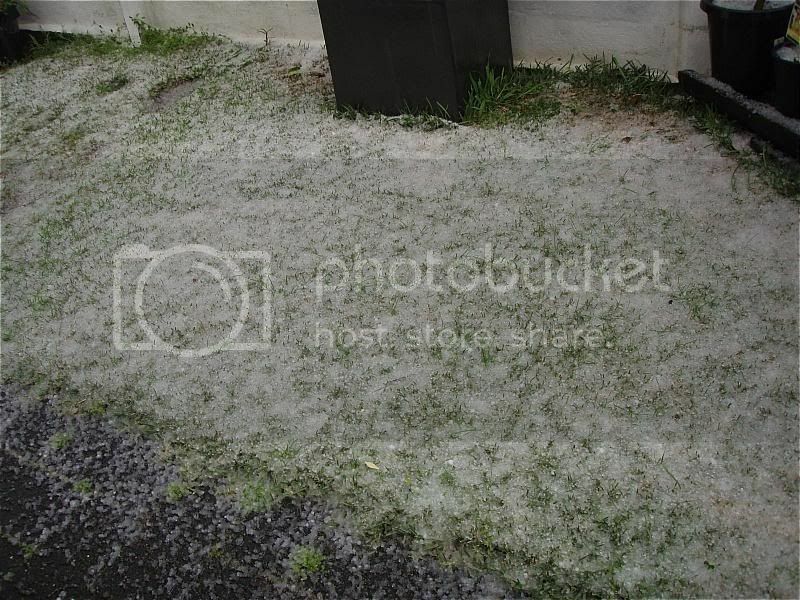 IT looked like snow, and it felt like snow, but in what may come as a disappointment to Sydneysiders, today's winter whiteness was just soft hail. 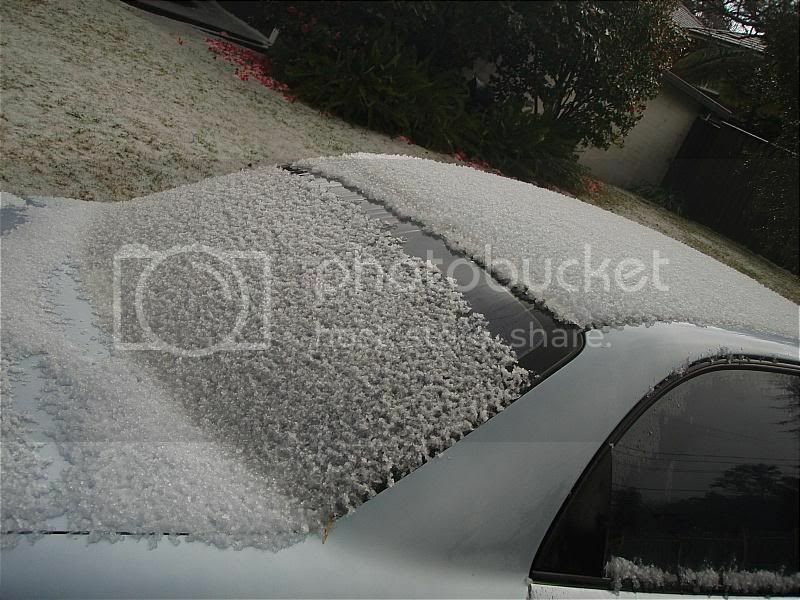 Just after 3.30pm (AEST) this afternoon the area around Lindfield, Roseville and Killara became blanketed in white as a thunderstorm brought a winter wonderland to parts of northern Sydney. 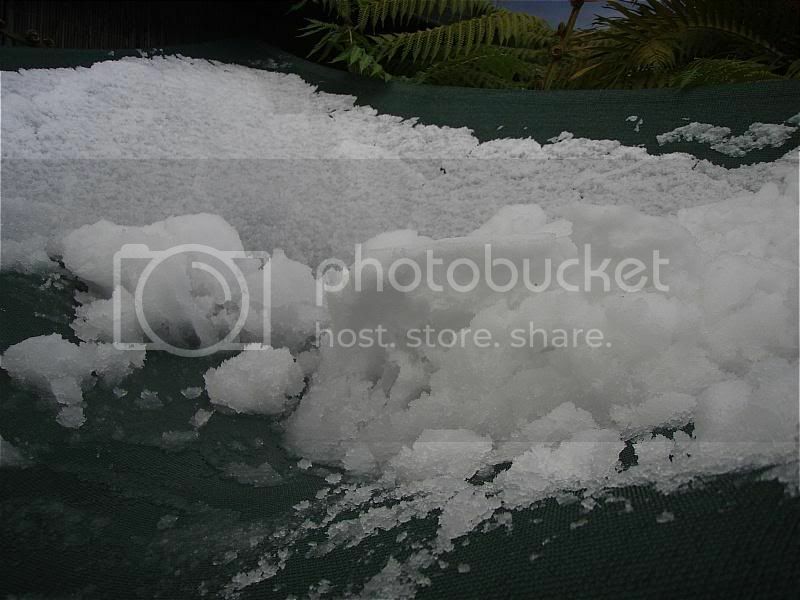 An electrical storm left thousands of homes without power in Brisbane, as snow and hail fell in Blue Mountains near Sydney. Tempestade brutal! As imagens da BBC sobretudo são espectaculares!